Benefits of dates for Sahur has many virtues among them can form energy in the body that is suitable as energy when fasting. Date palm fruit is a fruit that comes from the middle east, sweet and distinctive taste to be one of the attractions for the audience. Date palm fruit is often used as a fasting time for Muslims but besides the nutritious content of dates is also recommended for consumption at dawn. Dates can be used as additional snacks after consuming staple foods such as rice or bread. Date palm fruit with the name Phoenix dactylifer is found in arabia. Dried fruit there is dry (tamr) colored black and some are wet (ruthab) green to brown. The fruit is small and clustered. This fruit is perfect for sahur because it contains lots of vitamins and minerals. Dates are a good source of energy, sugar, and fiber. 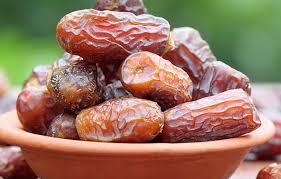 Important minerals such as calcium, iron, phosphorus, sodium, potassium, magnesium, and zinc are found in dates. Dates also contain vitamins such as thiamin, riboflavin, niacin, folate, vitamin A and vitamin K. With these ingredients, dates can treat some diseases such as constipation and bowel disorders. Sugar content in dates can be used as a source of energy during fasting. In many history was explained that the date is a blessing and in the Sahur there is blessing. Like the benefits of halal food, the Prophet sallallaahu 'alaihi wa sallam also strongly recommend the meal with dates "The best of the believer is the date dukma". (Narrated by Abu Daud 2345, Ibn Hibban 3475 and almighted al-Albani and Syuaib al-Arnauth). In contrast to the benefits of fasting for the kidneys, the American Cancer Society recommends a fiber intake of 20 to 35 grams per day, which can be met by consuming dates. Dates can increase energy within 30 minutes for those who consume them. Abdominal cancer or often called stomach cancer begins when cancer cells form in the lining of the stomach. These cells can grow into tumors. The disease usually grows slowly over the years. This cancer is one of them caused by overweight or obesity. Based on a survey of modern medicine, dates have been recognized to help the process of prevention of abdominal cancer. Breaking the fast and eating with dates helps to avoid overeating. As the body begins to absorb the nutrients contained in the dates, hunger is also lost. Also, the nervous system can be helped by eating dates, because the nervous system has high amounts of potassium. Dates work as tonics that benefit the entire age group, and in some cases, dates work better than traditional treatments, and naturally, so they do not have a negative impact on the human body. Dates can be digested quickly and easily to obtain energy quickly. Twilight can be prevented by eating dates. In contrast to the benefits of fasting for the kidneys consume 1 fruit per day is also believed to help maintain the health of your eyes for life. Dates are known to be effective enough to protect the eyes from night blindness. If the leaves of palm palm are pounded and smeared around the eyes, or when dates are eaten, it is proven that dates can reduce night blindness, and this solution is often used in rural areas where dates are grown for alternative medicine. Like the benefits of breaking the fast with dates, Dates are also a rich source of potassium, which studies have shown that potassium reduces the risk of stroke and other heart-related illnesses. consuming dates is recommended as a healthy and tasty way to reduce LDL cholesterol levels in the body, which is a major contributing factor to heart attacks, heart disease, and stroke. vitamin content in dates makes ideal dates for improving the health and functioning of the nervous system. Potassium is one of the main ingredients in promoting a healthy and responsive nervous system, as well as increasing the speed and alertness of brain activity. Therefore, dates are a good source of food for aging people and their nervous system power is declining, as well as for people who want to keep their mind sharp. dates have a very high mineral content, which is beneficial for various health conditions, but the high iron content in dates makes it a dietary supplement for those suffering from anemia. High iron content balances iron deficiency in anemic patients, increases energy and energy, and at the same time reduces fatigue and lethargy. In contrast to the benefits of pineapple juice the content of nicotine in dates is considered useful in curing various kinds of intestinal disorders. Regular consumption of dates helps to inhibit the growth of pathological organisms and helps stimulate beneficial bacteria in the intestine. For digestive problems, dates contain soluble and insoluble fibers, as well as amino acids that are useful for stimulating the digestion of foods and making digestion more efficient, which means more nutrients will be absorbed by the digestive system and enter the body for proper use. a very high mineral content on dates makes it a super food to strengthen bones and fight off diseases like osteoporosis. Dates contain selenium, manganese, copper, and magnesium; all of which are components of bone growth and strength, especially for people who are getting older and their bones begin to weaken. So eat dates and feel the benefits on your bones. Here are the various benefits of eating dates. May be useful.